Yes, I know this site is all about scarf wrapping, but I have been meaning to make a video about hats for a while, as many of you have requested it. I don’t wear them often, so therefore I have some questions for YOU! Fellow hats wearers, what are your hat tips and tricks? I do have a number of hats that I wear when running out of the house and/or when I want a change from scarves (or extra warmth). Here are some that I’ve worn recently! – Is it possible to eyeball hats and know how they will look without uncovering your hair in the store (goes for online as well)? – What do you wear underneath, if anything? – How do you make the back of your head/bun part look good (aka not shlumpy)? – Do you show any hair at the front? 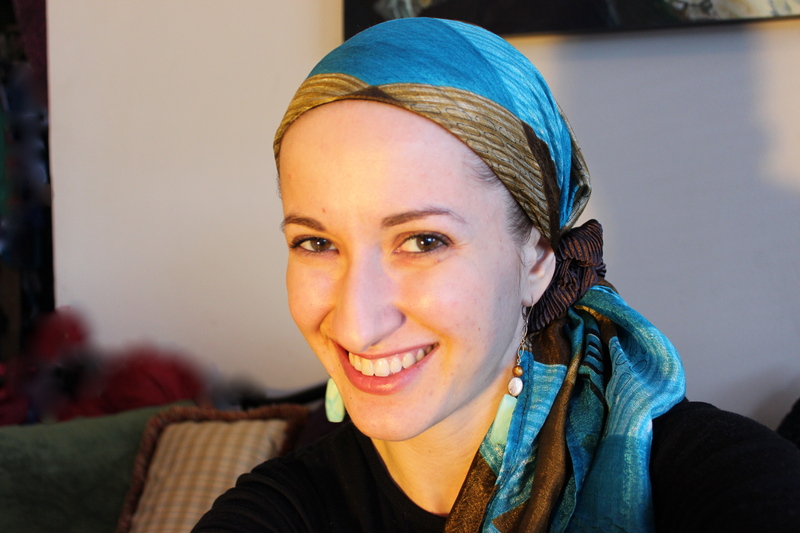 I find that I really don’t like the way that I look when covering all my hair in my hats… so I show a very minimal amount (fine according to the Jewish law I follow). However, I personally am not comfortable doing this, which is why I tend to avoid hats. Advice? – Any recommendations on where to buy hats? Also, please share your favourite hats!! I hope that everyone had a lovely weekend and is looking forward to a productive week filled with beautiful moments, surprises, achievements, special connections and of course, gorgeous head wraps! Say “Hello” to This Week’s LADY WRAP STAR!! Introducing Elizabeth, our latest hair wrapping inspiration – who loves creating beautiful colour and texture combinations! Here she is, answering some questions and showing us some of her creations. Read on for some beautiful and fascinating insights! Tell us a bit about yourself! What do you like to do? When I am not busy with my Husband and son I really enjoy spending time with my friends and helping others. How long have you been covering? I started covering with hats last spring but quickly switched to scarves exclusively. 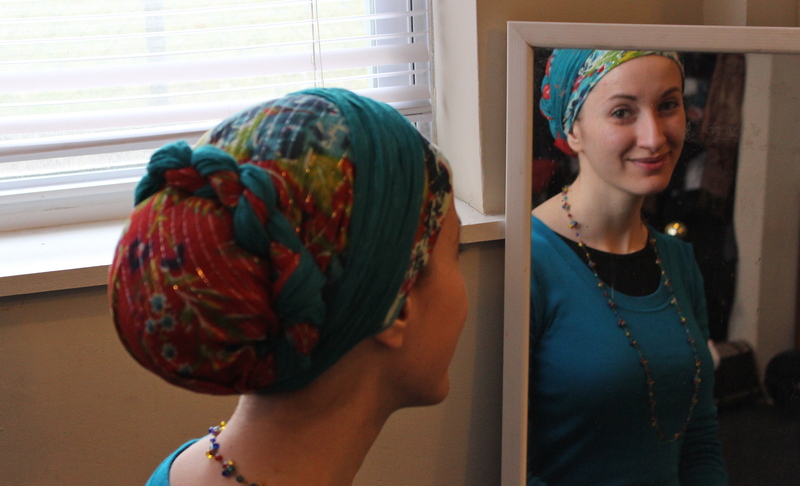 Do you remember the first time you wore a head covering? What did it look like? How did it feel? What did others say? When I first started wrapping I was surprised by the reaction of others. My husband said I looked glamorous like a movie star. Strangers in public suddenly treated me with an extra dose of respect that I didn’t get before. My parents are a bit baffled but have stopped asking and looking at me like I have seven heads. When I cover my head I am reminded of something deeply personal to me. So that is a constant good feeling. I also find that I have a lot less mean self talk. I was really surprised to realize how much I used to say I hated my hair or hated that it would not do what I wanted. Now that my hair is a non issue I don’t put myself down so much. I also put more care into how I look over all now. You just cant take the time to pick out a pretty scarf (or 2 or 3) and not take the time to match a pretty top and put on some lipstick! What are you wearing on your head today? 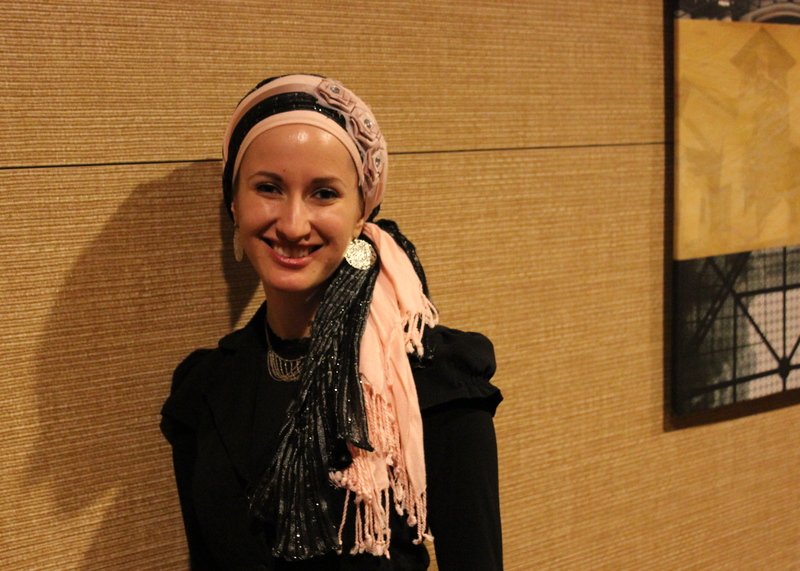 A navy blue pashmina and an oat colored stretchy headband. What is your favourite scarf and/or accessory? My favorite is a yellow and green flowered tichel with the hot pink border – it is in the picture of me with my son. My family first, and the women friends, both here in my everyday life and in my virtual life. I have friends that I have never met in person but who I have loved and cared for for over a decade! What is favorite scarf secret? My bath scrubby volumizer. http://www.youtube.com/watch?v=DkbRTaABO08 [left of drawer, below] and the velvet headband! 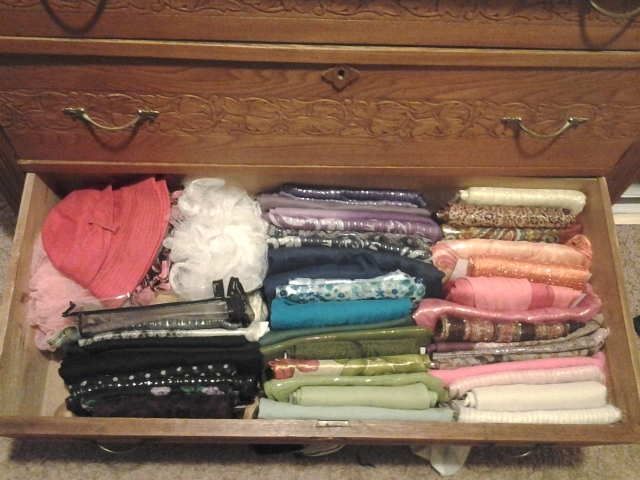 Take a look at Elizabeth’s scarf storage idea! Thank you, Elizabeth for contributing your love and and many of your beautiful ideas to this site! You are an inspiration! Yes, that’s a scrunchie that you see holding this silk scarf in place. First time wearing a scrunchie since the age of… 8? Well, with this scarf, I think it looks cute as a side “ponytail”! What do you think? 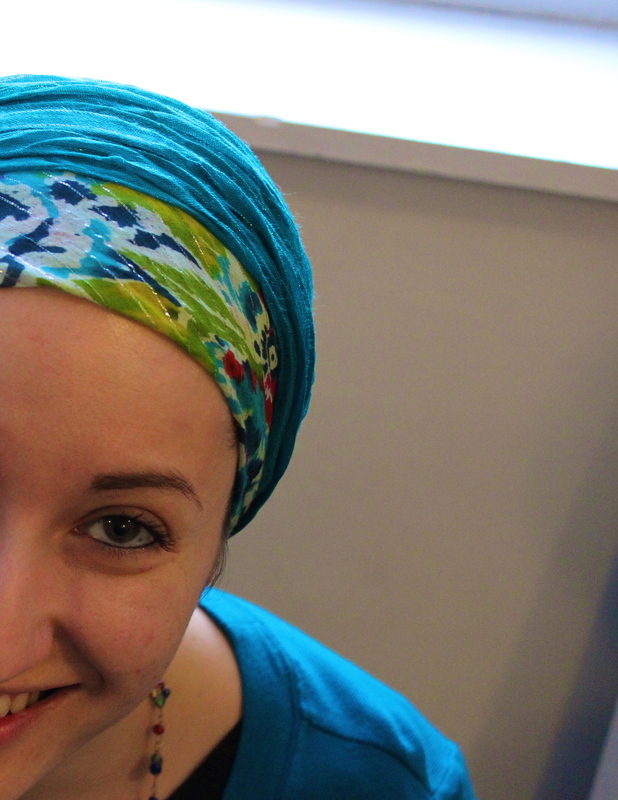 Our First “Lady Wrap Star” ~ Rivka Malka! 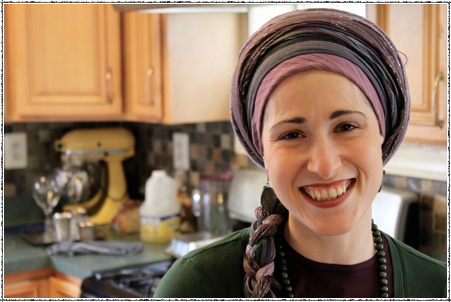 Rivka Malka is a woman with so much to give, and someone that I look up to very much. Along with being a wonderful wife, mother, mentor, teacher, cook, speaker, and friend, she also wears the most stunning scarves on her head! Here are some photos of her creations. Love the colours! 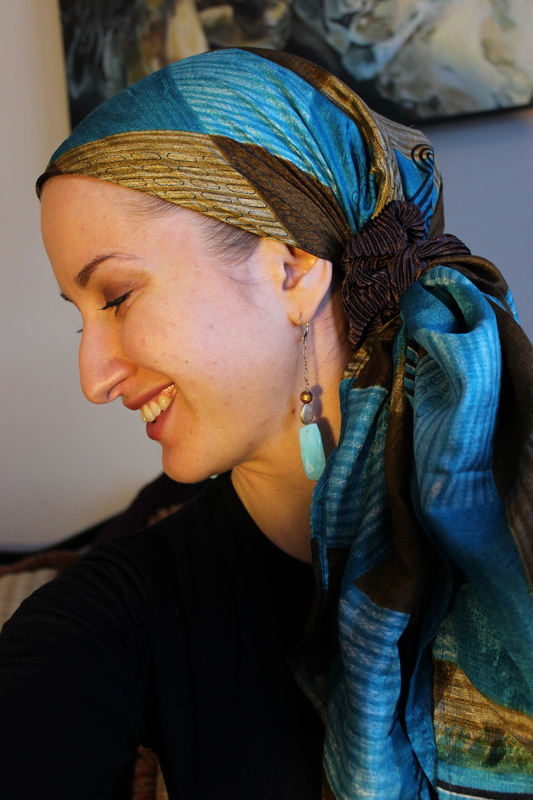 Rivka Malka also has a beautiful site – rivkamalka.com. In it, you’ll find lots of brilliant, deep, quirky, informative and creative videos, writing, and photos. The site is about everything spiritual, and everything fun! Have fun exploring! The search is on! We are looking to showcase other faces! This site is going to be geared towards women from all sorts of backgrounds, colours, faiths, shapes, styles, and personalities. So… do you love hair wrapping? 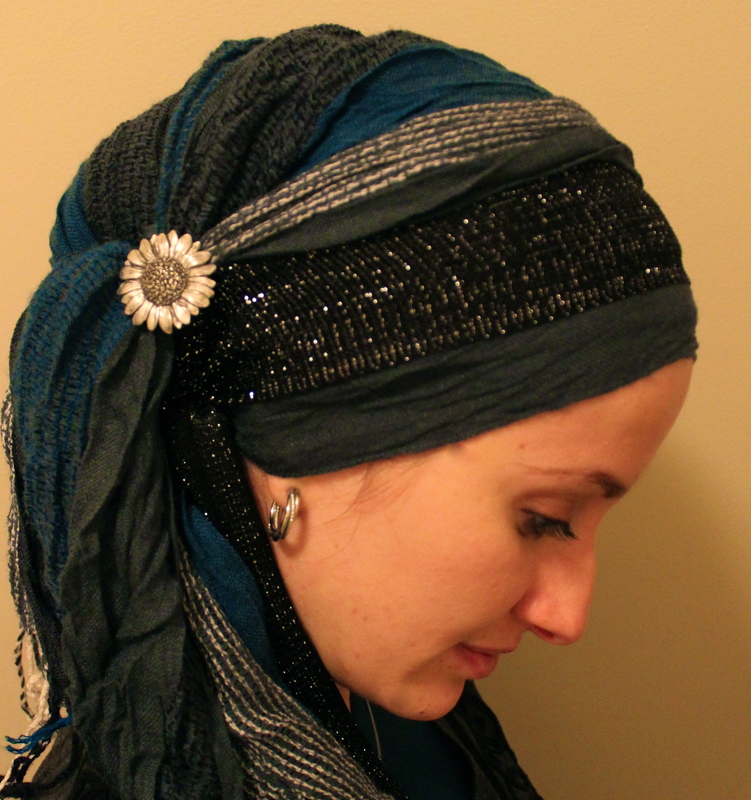 Or does someone you know wear fabulous, creative hair coverings? Send an email with photos and we will make a feature post starring our guest “wrap star”. ~ If you haven’t already, check out the Wrapunzel Facebook Page and give it a “like” to receive updates and give your input! ~ If you want to write to me privately, my email is andreaesthergrinberg@gmail.com – drop me a line and say hello! ~ What do you think, so far? How do you like the layout of the site, the archives from andreagrinberg.com (are they easy to look through? ), the accessibility, sharing, photos etc.? ~ How do you like the posting style? I know there haven’t been any substantial posts yet other than the hair wrapping workshop, but what do you think of the daily wrap? Is it too much to do daily? Do you think I should do it once every other day instead? ~ Anything else? Many of you have already submitted great ideas about what you would like to see on here… but if you haven’t asked your question or given your ideas yet, now is the time! ~ Do any of you know of any forums where I should be sharing this site? 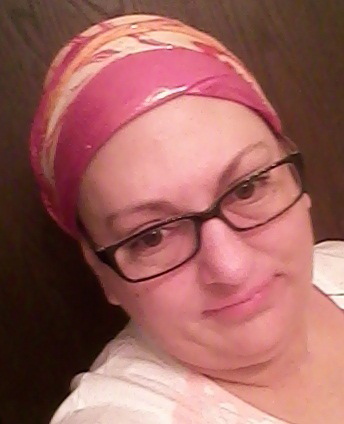 I know there are a lot of hair loss support groups out there, as well fashion forums, and other faith groups. However I don’t know where to start looking. Please, share your suggestions with me. There are for sure many people out there that could really use Wrapunzel. It’s not every day that one of your best friends gets married! Yesterday I had the joy of attending the wedding of my dear friend, who also happened to be the shomeret (Jewish equivalent of maid of honour) in my wedding! Of course, for such a special wedding, I needed to create something special to wear on my head. Here it is! 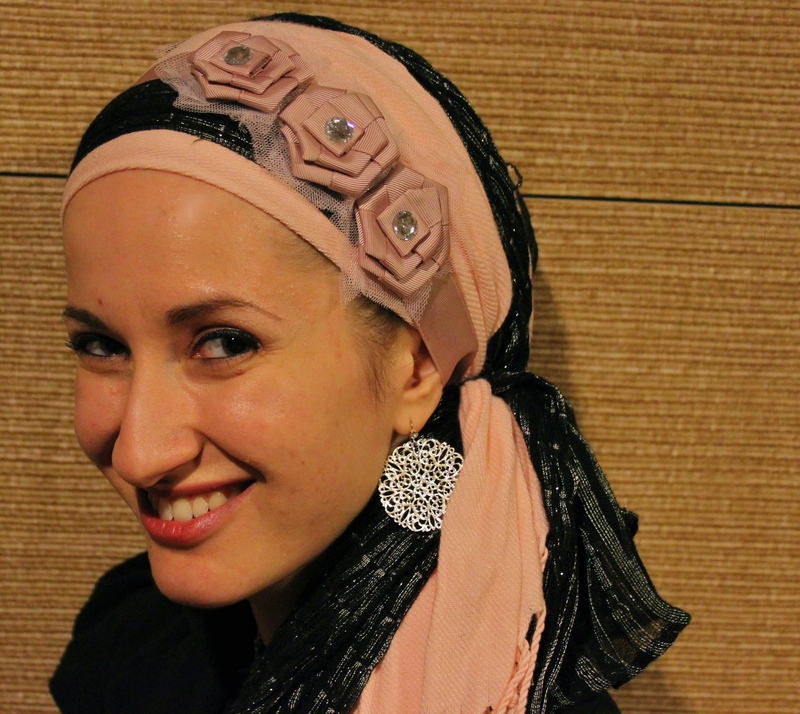 To do this wrap, I took two long scarves (pink and sparkly black… pink is one of the bride’s favourite colours!) and wrapped them asymmetrically around my head so the tails hung one longer than the other. Then I took the longer tails and wrapped them around my head, tying them to the shorter ones. This look was completed with a beautiful headband, that was actually given to me by the beautiful bride before my wedding day. Mazal tov!